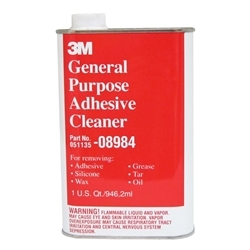 3M General Purpose Adhesive Cleaner 08984, 1 Quart BOWES 3M 08984. Will not harm most thoroughly cured automotive paint, vinyl or fabrics when properly used. Part numbers 08984 and 08986 have a VOC content of 816 grams per liter (6.8 lbs per gallon). Composite Partial Pressure equals 4.81 mmHg. Local air quality regulations may regulate or prohibit the use of surface preparation and cleanup materials based on VOC content. Consult your local air quality regulations.